The Packers sold stock 2011/12 for $250 plus a $25 handling fee. What a great collectible, especially for a cheese-head! 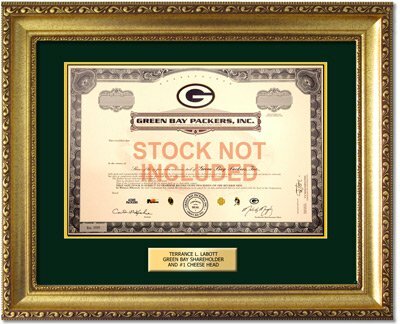 Although we can't offer Green Bay Packer stock on our website, we do offer custom frames and mats that fit. We love the idea of letting people own a share of a company (or a football team) that they LOVE and that is what GiveAshare.com is all about. 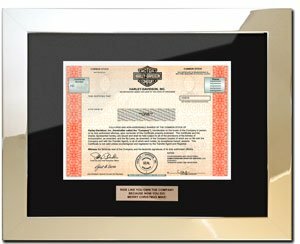 We offer true one share ownership in over 100 companies like Disney, Harley-Davidson, Starbucks, Google, Nike and a whole lot more including Madison Square Garden, owner of the New York Knicks and New York Rangers. See our entire stock list.